Find device-specific support and online tools for your BlackBerry Classic smartphone. Discover how to search for and download an app in BlackBerry World on your BlackBerry Classic. A visual walkthrough for uninstalling an app on your BlackBerry Classic. Browse, sort, edit and share documents with Docs To Go on your BlackBerry® Classic. Watch this video to learn how. Discover how to add a BlackBerry Messenger contact on your BlackBerry Classic. Discover how to join a BlackBerry Messenger group on your BlackBerry Classic. Discover how to peek at BlackBerry Messenger chats on your BlackBerry Classic. Discover how to ping a BlackBerry Messenger contact on your BlackBerry Classic. Discover how to start a BlackBerry Messenger chat on your BlackBerry Classic. Discover how to access your Facebook account on your BlackBerry Classic smartphone. Learn how to log out of Facebook on your BlackBerry Classic smartphone. A visual walkthrough on how to update your Facebook status on your BlackBerry Classic smartphone. Learn how to find nearby places using BlackBerry Maps on your BlackBerry Classic. A visual guide on how to navigate to a location using BlackBerry Maps on your BlackBerry Classic smartphone. Learn how to add layers to BlackBerry Maps to view traffic, transit lines and more on your BlackBerry Classic. Discover how to access your Twitter account on your BlackBerry Classic smartphone. Learn how to tweet on your BlackBerry Classic smartphone. Here's how to open, download, restore and delete documents in Verizon Cloud for your BlackBerry 10 device. Here's how to manage your music on your BlackBerry 10 device via Verizon Cloud. Learn how to back up contacts so you never lose them and can transfer them to a new device with Verizon Cloud on your BlackBerry Classic. Discover how to back up your photos, videos, music and documents with Verizon Cloud so you never lose your content and can free up memory on your BlackBerry Classic. 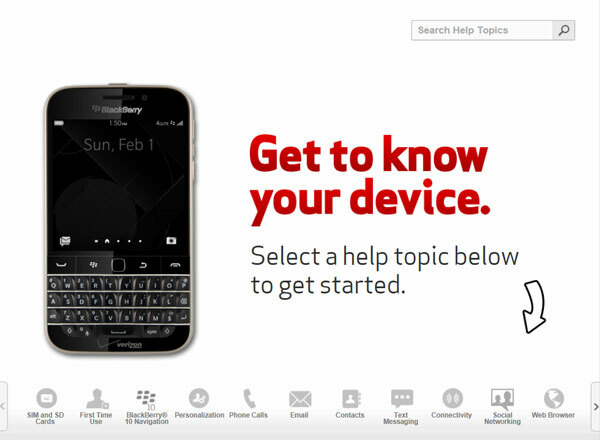 An interactive guide on how to download files from Verizon Cloud onto your BlackBerry Classic. An interactive guide on how to set up Verizon Cloud on your BlackBerry Classic. An interactive guide on how to get more Verizon Cloud storage using your BlackBerry Classic. Here's how to remove the Verizon Cloud app on your BlackBerry 10 device.